The MAVEN mission has identified the process that appears to have played a key role in the transition of the Martian climate from an early, warm and wet environment that might have supported surface life to the cold, arid planet Mars is today. MAVEN has been examining how the solar wind and ultraviolet light strip gas from of the top of the planet’s atmosphere. 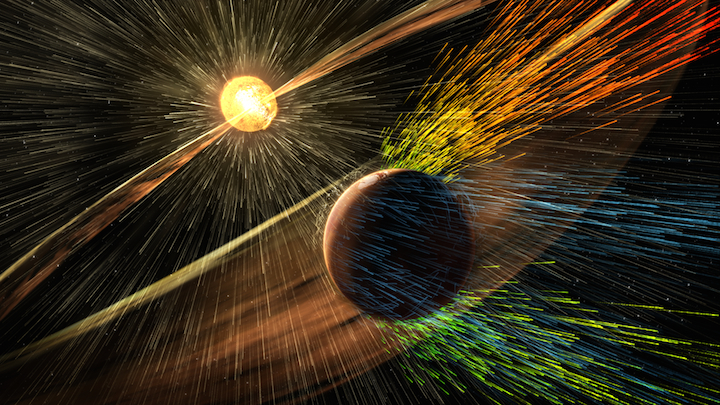 New results indicate that the loss is experienced in three different regions of the Red Planet: down the “tail,” where the solar wind flows behind Mars, above the Martian poles in a “polar plume,” and from an extended cloud of gas surrounding Mars. The science team determined that almost 75 percent of the escaping ions come from the tail region, and nearly 25 percent are from the plume region, with just a minor contribution from the extended cloud.